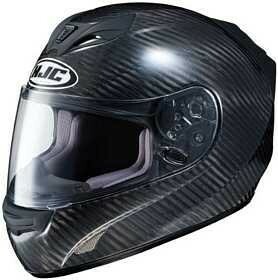 The HJC FS-15 Carbon Helmet is a nice entry into that line. Carbon fiber, while not the primary player in the helmet construction, is becoming a major influence on the market. This HJC carbon helmet features a wind tunnel-tested shell shape, which is always an important element for a sportbike shell. It also boasts an advanced venting system that pulls hot, humid air out the back and away from the rider's head. HJC also claims that the helmet has a "vortex" system in the chin-bar that wicks humid air away from the shield, preventing shield fogging. Speaking of the shield, the removal mechanism is of the tool-less design that I personally prefer. Also, the shield has a closure system that pulls it very tightly to the rubber seal for a quieter ride. Owner reviews of this helmet are amazingly positive, so it looks like HJC has another winner on its hands here. It is also very affordable by carbon fiber standards. It comes in four colors, each of which retains full view of the carbon fiber weave. Sizes run from XS-2XL. Here's a similar carbon fiber helmet from Joe Rocket.